An adjective is a word that describes something (a noun). An adjective gives us more information about a person or thing. The order is To Be + Adjective. Adjectives sometimes appear before a noun. The order is Adjective + Noun. BUT… Sometimes you want to use more than one adjective to describe something (or someone). What happens if a hat is both brown AND old? Do we say… an old brown hat OR a brown old hat? An old brown hat is correct because a certain order for adjectives is expected. A brown old hat sounds incorrect or not natural. So what is the correct order of adjectives before a noun? If we take the first letter of each one, it creates OSASCOMP which is an easy way to remember the order. Let’s look at an example about describing a bag. It is not common to have so many adjectives before a noun, but I do this so you can see the correct order of adjectives. Ugly is an opinion, small is a size, old refers to age, thin refers to shape, red is a color, Italian refers to its origin, cotton refers to the material the bag is made of, sleeping is the purpose of the bag. A beautiful long white French silk wedding dress. Large ancient Greek clay flower vases. Here we have a dress. Dress is a noun, the name of a thing. Let’s describe this dress. What type of dress is it? What is the purpose of this dress? Let’s image the dress is made of silk. It isn’t made of plastic or gold, it is made of silk. Now, this dress was made in France. France is a noun, its adjective is French. a French silk wedding dress. a white French silk wedding dress. a long white French silk wedding dress. Let’s add one more adjective. Is the dress beautiful or ugly? Well, you should always say it is beautiful or it will ruin her wedding day. Now of course we don’t normally add so many adjectives before a noun. 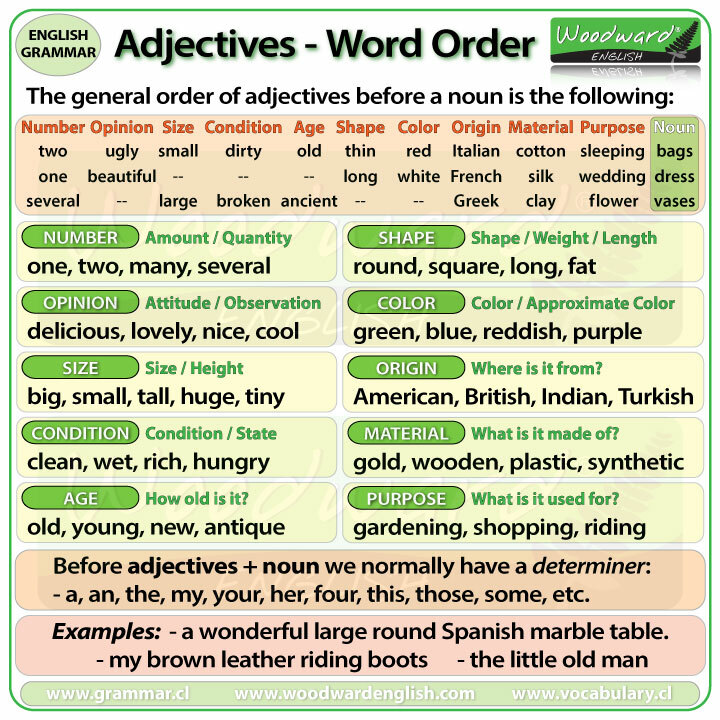 This example is just to show you the order of adjectives. IMPORTANT: The order of adjectives before a noun is NOT 100% FIXED. This chart is only a guide and is the order that is preferred. 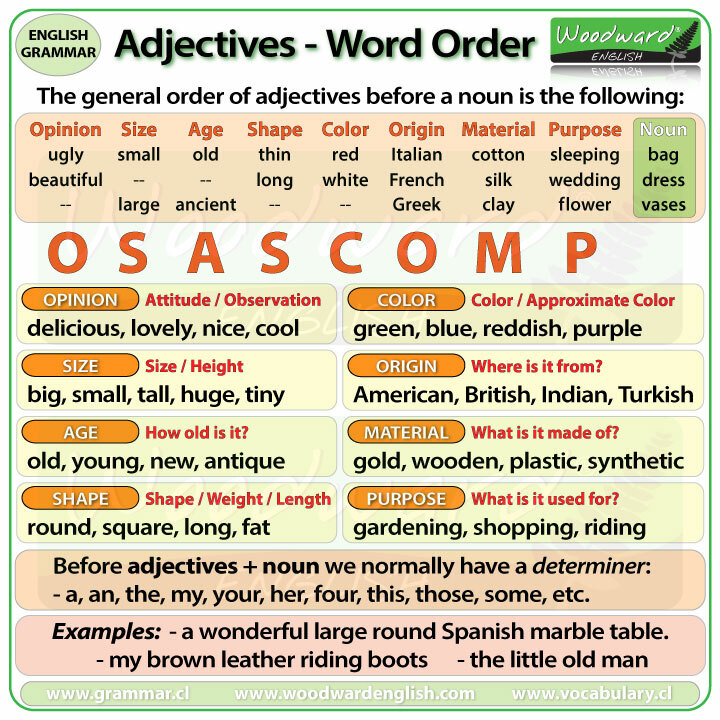 You may see or hear slight variations of the order of adjectives in real life though what appears in the chart is the order that is expected the most. Opinion: These adjectives explain what we think about something. This is our opinion, attitude or observations that we make. Some people may not agree with you because their opinion may be different. These adjectives almost always come before all other adjectives. For example: She is sitting in a comfortable green armchair. Comfortable is my opinion or observation, the armchair looks comfortable. The armchair is also green. Here we have two adjectives. The order is comfortable green armchair because Opinion (comfortable) is before Color (green). Size: Adjectives about size tell us how big or small something is. For example: a big fat red monster. Notice how big is first because it refers to size and fat is next because it refers to shape or weight. Then finally we have the color red before the noun. Age: Adjectives of age tell us how old someone or something is. How old is it? Scary is my opinion, old refers to the age of the house. Scary is before old because opinion is before age. Shape: Also weight and length. These adjectives tell us about the shape of something or how long or short it is. It can also refer to the weight of someone or something. For example: a small round table. What is the shape of the table? It is round. What is the size of the table? It is small. The order is small round table because size is before shape. Color: The color or approximate color of something. Our example: a long yellow dress. What is the color of the dress? It is yellow. The dress is also long. Long which is an adjective of shape or more precisely length, is before an adjective of color. Origin: Tells us where something is from or was created. Remember, nationalities and places of origin start with a capital letter. For example: an ancient Egyptian boy. His origin is Egyptian. Egyptian needs to be with a capital E which is the big E.
Ancient refers to age so it goes before the adjective of origin. Material: What is the thing made of or what is it constructed of? Pearl is a material. They generally come from oysters. The necklace is made of what material? It is made of pearls. The necklace is also beautiful so I put this adjective of opinion before the adjective referring to material. What is the purpose of the desk? It is a place for my computer, it is designed specifically to use with a computer. It is a computer desk. In this case, the desk is also very messy. Messy is an opinion. Some people think my desk is messy. So, the order is opinion before purpose. So this is the general order of adjectives in English and you can remember them by the mnemonic OSASCOMP. BUT did you know that we could add some extra categories? We can add the adjective categories of Number and Condition. Number: Tells us the amount or quantity of something. It is not only for normal cardinal numbers like, one, two, three… but also other words that refer to quantity such as many or several. Number adjectives go before all the other adjectives, including adjectives about opinion. Hungry is a condition or state so the order is Three hungry dogs. For example: Two smelly old shoes. Smelly is a condition or state. Smelly is before old which refers to age. The number two is at the beginning as numbers always are.